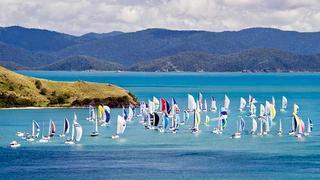 Australia's most successful keelboat regatta gets under way on Friday 19 August in the waters around Hamilton Island and its neighbouring Whitsundays with a full week's programme of on-the-water racing and on-shore events and parties for the 192 participating yachts, their owners, crews and guests. Founded in 1984, the regatta has always been successful, but in recent years it is making a bigger splash than ever before, especially with the development of its host island into a luxury resort with facilities that can only enhance the on-shore social agenda, and the introduction of superyacht divisions - sailing yachts last year joined by motor yachts this year. On the water there are four classes for racing boats (IRC Grand Prix, One Design, Performance Racing and Sports Boats ) and four classes for what are described as 'the not-so-flat-out racers' and cruising boats (IRC Passage, Cruising, Non-spinnaker and Superyachts). Nevertheless all the racing is competitive and even for the cruisers the idea is to get to the finish line as fast as possible. The first race on Saturday 20 August is one to Lindeman Island for all classes except SB3, and in its wake the IRC Class A and Class B races. In the following days there are more races for IRC Classes A,B and C, as well as Melges 32 Class, SB3 Class and Performance Racing. All classes partake in several around-the-islands races in the course of the week, and superyachts join the IRC Classes A and B in the Club Marine Classic Long race on Tuesday 23 August. The finale will be a Molles Island Race for all classes except SB3, culminating in the presentation of trophies at an awards dinner on Saturday 27 August. Back on shore owners, friends and guests congregate for cocktails, dinners, beach and poolside barbecues, golf challenges and clinics, fashion shows, and degustations and masterclasses with fêted Australian chefs featuring matching wines from Robert Oatley Vineyards - not to mention the nightly crew parties. One notable visitor to Race Week will be the America's Cup itself - the oldest trophy in the history of international sport which marks its 160th anniversary on 22 August. On prominent display at Hamilton Island Yacht Club, the trophy's presence at Audi Hamilton Island Race Week - its third ever appearance in Australia - is recognition of the regatta's stature on the international racing scene. The trophy is currently held by Golden Gate Yacht Club in San Francisco after Larry Ellison's trimaran BMW Oracle defeated Alinghi last year (incidentally skippered by Australian Jimmy Spithill), but it was the shock win of Australia II which wrenched the Cup from the Americans back in 1983, ending the longest winning streak in sporting history. That momentous event had something to do with the inauguration of Hamilton Island Race Week for the regatta was built on the energy that had spread across the nation following Australia's historic America's Cup victory. The local regatta that Hamilton Island's then owner, Keith Williams, and local yachting enthusiast Dave Hutchen instigated 28 years ago has come a long way to the international event it now is, and the recent inclusion of superyachts has ensured its place in the superyacht calendar too.